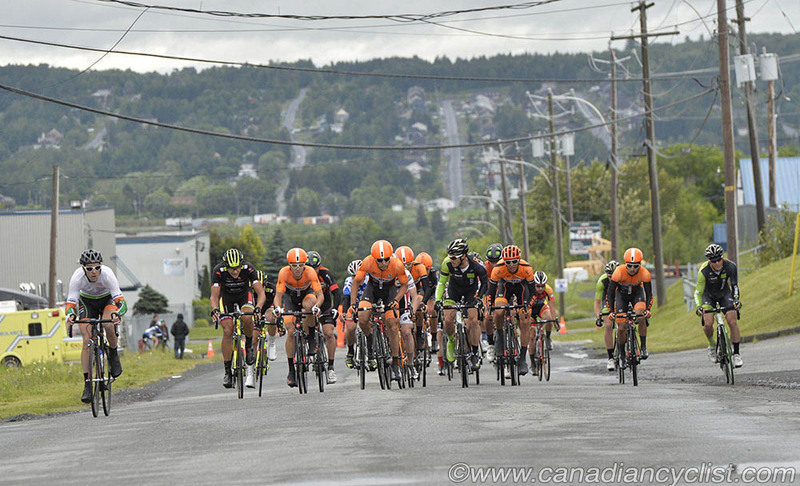 The 2015 Canadian Road National Championships concluded on Sunday with the Criterium events for women and men. Alison Jackson (Twenty16 p/b Sho-Air) took the women's title, while Silber Pro Cycling swept the top five spots of the men's race, led by Ben Perry with the win. The square 1.3 kilometre circuit consisted of four left turns with the finish on the same tough 200 metre climb used for the road races. 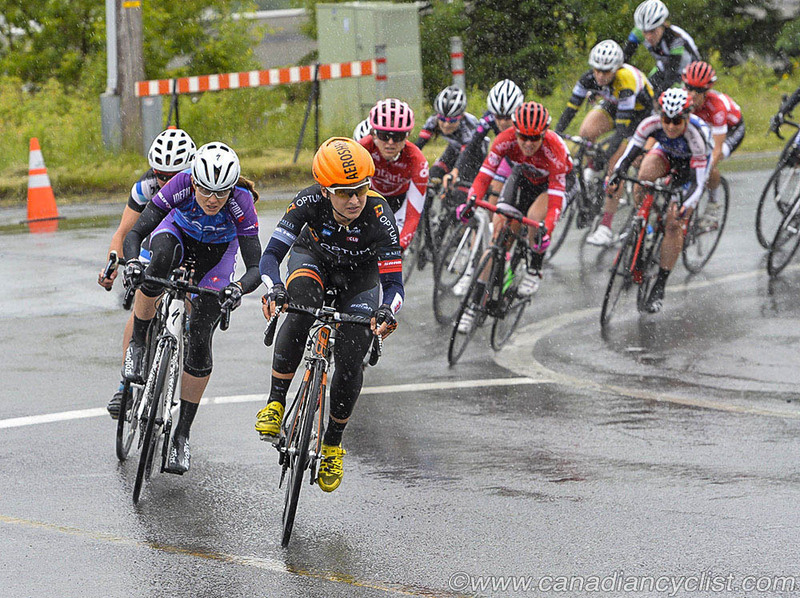 The women started in steady rain with gusting wind; conditions that made the riders cautious for the first few laps of the 28 lap race. Leah Kirchmann (Optum Pro Cycling) was the defending champion, but lost her supporting team mates, Annie Ewart and Lex Albrecht, by the halfway mark, leaving her vulnerable to repeated attacks by the strong Trek Red Truck squad. 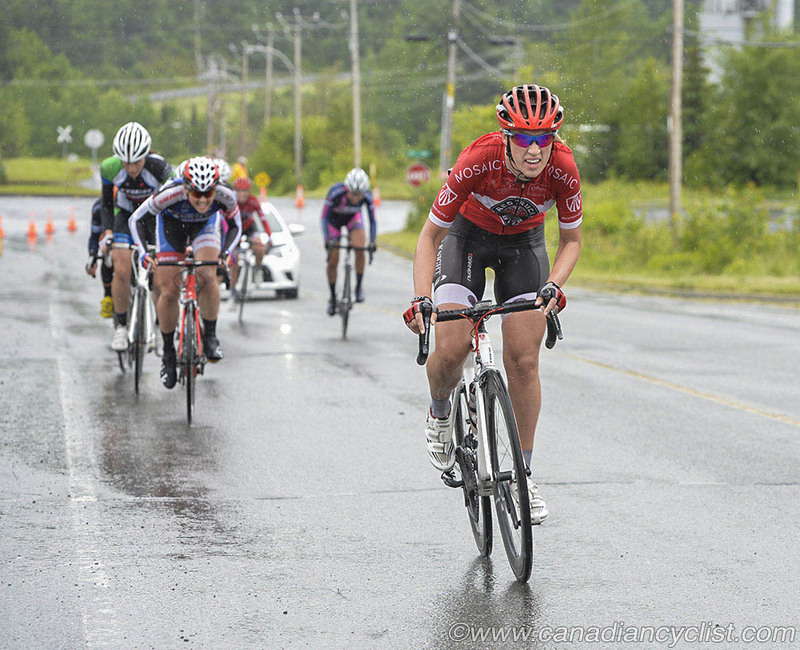 When Denise Ramsden (Trek Red Truck) launched her attack with ten laps to go, Jackson quickly bridged up. Kirchmann tried to respond, but couldn't shake Ramsden's team mates Guloien and Bergen, and had to watch the winning move go up the road. Jackson and Ramsden worked well together until the final climb, when the Twenty16 rider jumped and ramsden could not respond. 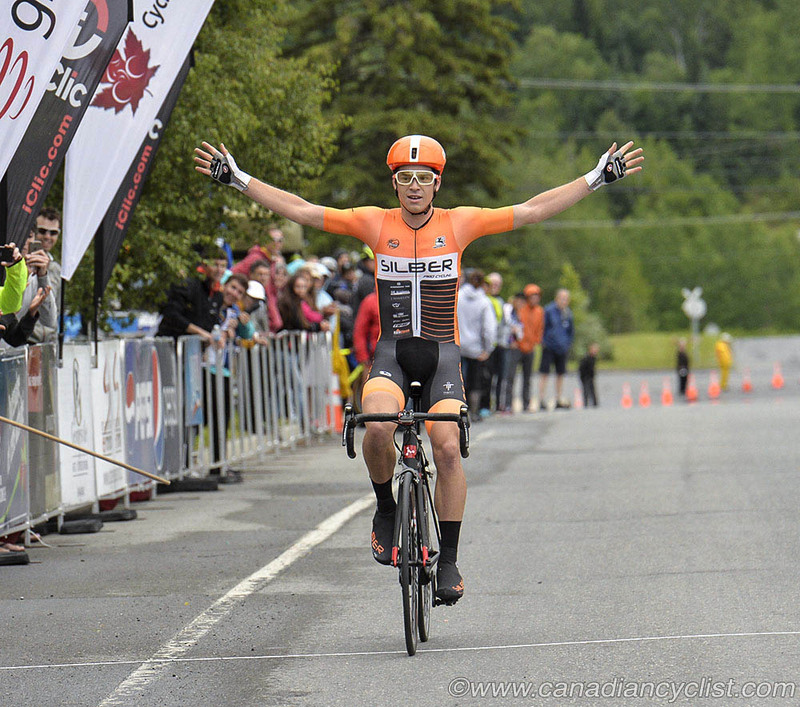 Kirchmann salvaged a podium spot by winning the sprint for third. Only 11 of 45 starters finished. "The rain and the course just set it up to be hard," said Jackson. "Trek Red Truck had a team to support any moves, and Leah [Kirchmann] had to do a lot of work. It was great to be up there with Denise, she's a strong riders, but I knew when it came to the hill, that it was mine. I've been climbing well all year, and I knew I could do the uphill sprint." 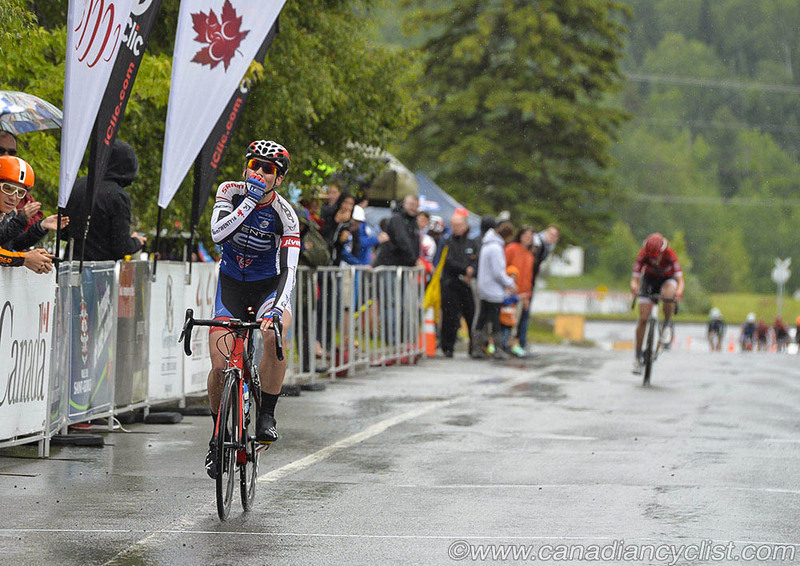 The men's race saw the rain and wind end, although the roads remained wet until the last third of the 33 lap race. Silber, with eight riders in the field and coached from the sidelines by team manager and former pro Gord Fraser, took control of the race from the start. Any break attempt had at least one (and usually more) Silber rider attached to it, and any rider considered dangerous was smothered by the orange jerseys of the team. After multiple break attempts all failed, Perry rolled off the front with a little more than half the race remaining. Initially he just dangled 10-15 seconds ahead of the field, joined briefly by team mate Mike La Rossignol. Perrick Naud, the only member of the Optum team in the race, tried to get across multiple times, but he was rightly considered a major threat, and every move he made was covered by two or three Silber riders. Perry then started to steadily pull away, attacking the climb every lap, as the peloton essentially gave up the chase. 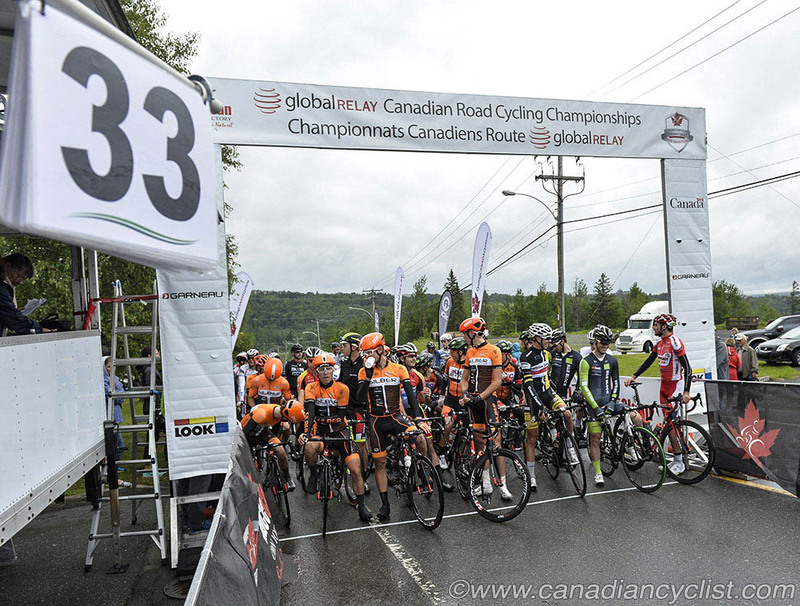 Emile Jean (Equipe de Quebec) tried to bridge with 12 laps to go, joined by Silber riders Nigel Ellsay and Alex Cataford, and later by a third team mate, Matteo Dal-Cin. As Jean tired, the three Silber riders dropped him to move into the second through fourth spots. 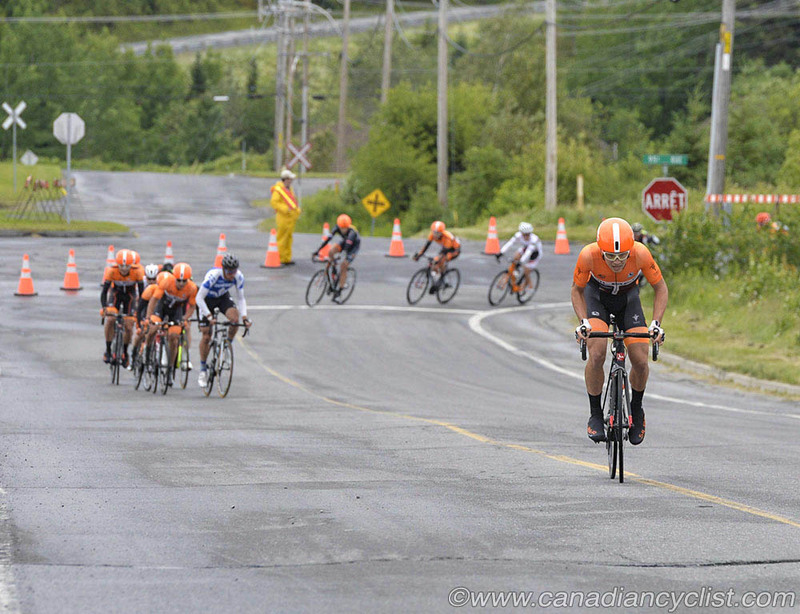 Perry rolled across the line solo for the win, followed by his three team mates, who came in together, with Ellsay taking second and Dal-Cin third, and then another Silber rider, Nicolas Masbourian, won the bunch sprint for fifth. "I didn't expect to be out there so long," admitted Perry. "I was just taking my turn off the front to put pressure on the other teams, and I guess my move was the right timing. I didn't have much of a gap for quite a while, but then the pack cracked a bit, I think. My team mates were covering everything, and it is thanks to them that i was able to stay away."